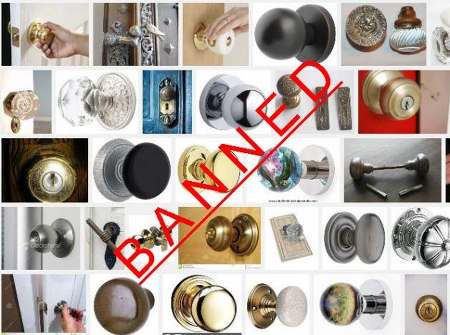 A Ban On Doorknobs - Worst Ban Ever! One of the most bizarre bans ever is gaining traction in cities across the country. A ban on doorknobs. First passed in Vancouver last November, now Halifax and Pickering, Ontario, are considering it. What could be the rationale behind this? What sort of society are we living in where this is how governments spend their time? For starters, it’s in the name of accessibility. The idea being that the elderly and infirm can’t grip doorknobs. Instead, lever handles are the answer. OK, ponders the reasonable person, I can see how that might be difficult for some. Which is why including levers in new public buildings — what most new ones already have — won’t be met with resistance. In November, the Pickering Accessibility Advisory Committee looked at plans for a new public centre. Not just government buildings. But private homes as well. What a leap. To go from the government selecting fixtures for their buildings, to regulating them for everyone else’s. Now most of us probably couldn’t care less what doorknobs we have. But what if we did? What if antique fixtures were your thing? In what twisted world would it be against the law to have such a hobby? Oh, right. This world. Where in the name of never-ending progress busybodies try to broaden the public domain so broad that there isn’t even room for a private domain anymore. “Mi casa, Su casa,” the bylaw officer says with a menacing smile. The September 2013 Vancouver policy report on this issue includes other nitpicky regulations for private homes. But there was a glimmer of hope. Staff did not recommend council make it law for new builds to have covered canopies and lighting near the front entrances. Why? “There were a number of adaptable housing provisions that were requested by the Advisory Committees that are currently the standard practice in new construction… there is no need to regulate items that are currently being provided.” A light went off in the heads of our government overlords! The most basic principle of supply and demand entered their brains: If the consumer wants something, she will simply ask for it. However, it doesn’t get better. It gets worse. That’s right. Government as Martha Stewart. Making sure your home is comfy for guests. But what sort of jerk invites a disabled or infirm person over and doesn’t help them navigate obstacles? Are elderly people randomly visiting our homes, unannounced and uninvited, without someone else present to assist them in opening doors? This is not the domain of government. This madness makes a mockery of the original concept of accessibility — that people shouldn’t be excluded from public facilities because they use wheelchairs, etc. No offence to people with carpal tunnel syndrome — I’ll gladly open a door for you any day — but your liberties end where mine begin. It’s none of your business whether I want the builder of my new home to fit my front door with a doorknob, a lever or a stale loaf of bread. Its hard to believe that there is a ban on door knobs? It would be great if you can explain it more elaborately.